In January of 2010, Mike Wolfe and Frank Fritz showed the world that their way of learning about history does not involve a textbook. Rather, it entails digging through what some may deem “trash” to recover the hidden gems of America’s past. 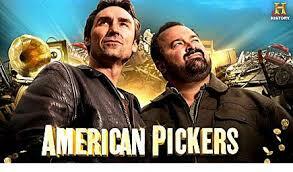 And as they learn more and more about America, Mike and Frank teach others through their show, “American Pickers.” In the midst of its 19th season, “American Pickers” is broadcasted on the History Channel. The pair is best described as grand “antiquers” as they drive throughout the country to rural areas to find things that are sometimes worth a surprising amount. This often means driving up to old barns, warehouses, garages, junkyards, or even going into homes and basements of people that have something to share. What the sellers have to share is not just an antique; it is also a story. The people that Mike and Frank meet are sometimes the most interesting part of the show – with witty remarks and surprising tales of the life of the piece and the personal connection that formed. Mike and his brother, Robbie, went picking in Colorado and found a giant cow-shaped RV (air date: April 16, 2018). Last year, the show visited Utah, New Mexico and Texas. The Texas Treasures and Texas Pick’em shows originally aired on July 16 and July 23 respectively.